Forgive me for the delay between this post and our last, but we are currently in the process of re-designing this blog and moving it to a different platform with the hopes of reaching a wider audience (more info coming soon). Anyway you probably have no idea who the man to my left is. I only know him because I’m a baseball nerd, and a Yankees fan. 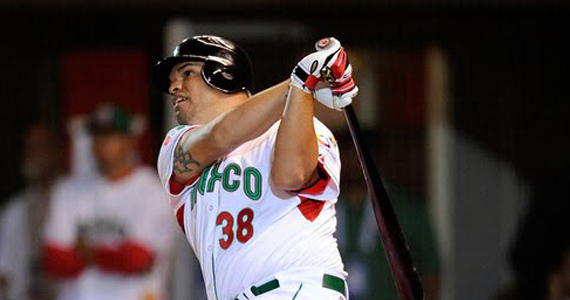 This Mexican behemoth is current Yankees minor-leaguer Jorge Vazquez. I’m sure you are still unsure of who he is, but we’ll have more on him later. Usually around this time of the season (June/July), teams are starting to look around the rest of the league for the missing pieces that can turn their good team into legitimate contender, or locks for the playoffs. Often, teams ignore their own farm systems in this search, even though the answer to their problems could be right there waiting for them. Here are four guys that we, at Jobu’s Rum, feel could have a huge impact on some current teams. I put young Anthony on the bottom of the list, because the Padres are in no danger of contending anytime soon, but I still feel the team could greatly benefit from calling him up. Originally drafted in the first round of the 2007 amateur draft by the Boston Red Sox, Rizzo was one of the central prospects in the deal that landed the Red Sox Adrian Gonzalez, and left the Padres with no chance to win in 2011. Rizzo showed promise in the lower minor league levels with the Red Sox, hitting 25 home runs and driving in 100 in 2010. So far this season, the young first baseman seems to have put it all together. In 49 games for the Tuscon Padres of the Pacific Coast League, Rizzo has been nearly obscene at the plate. He’s hitting .371 with a 1.172 OPS, has mashed 15 home runs (34 extra base hits in total) and driven in 60 runs. He’s even stolen 5 bases, just for fun! Why bother calling this kid up, you ask? Let’s face it. The Padres have 24 wins and 32 losses, and they’re not gonna get much further than last place (where they currently sit in the NL West). They just traded away their biggest star of the last 20 years in Gonzalez. The fans need something (or someone) to cheer for. Rizzo could be the guy that sparks that fan interest and gets people coming back to Petco Park to watch some games. It’s also fairly obvious that he has figured out AAA pitching. What better time to see what the kid can do in the big leagues? He’s not gonna make the team fall any further in the standings if he fails. Stay classy San Diego, and give Anthony Rizzo his shot! This brings us to the man in the picture above, Jorge Vazquez. I know you’re all wondering why I think the Yankees should bring this guy up, and not highly touted prospect and world beater Jesus Montero. Jesus is coming, but I think Jorge is the one who should pave the way for him. Vazquez was dominating the Mexican League when the Yankees signed him before the 2009 season. He hit as high as .379 and clubbed as many as 33 home runs while playing for Quintana Roo Angelopolis and the Mexico City Tigers. Keep in mind that they play between 70 and 80 games in the Mexican league, and the numbers are astounding. When he got into the Yankees Minor league system, Jorge just kept right on hitting. Despite battling injuries, he has shown that same average and power potential, although scaled down a bit because of better competition. This year, Vazquez led the Yankees in spring training home runs, and kept that momentum going into the regular season as well. In AAA Scranton/Wilkes Barre, Jorge is hitting .284 and has mashed 18 long balls (tops in the minors right now) and driven in 45 runs in just 48 games. Critics say he lacks patience and strikes out too much (13BBs, 62Ks), but the man can hit. Despite the fact that the Yankees are in first place, their offense has struggled with runners in scoring position, and other clutch situations. Also, the Yankees’ current Jorge (Posada), is simply stinking up the joint. How long can they let him hit under .200? He has already pretty much lost the starting DH job against left-handed pitchers. Vazquez is a little too old for AAA, and he’s showing that he might be a little too good for it too. I’d bring him up over Jesus Montero right now because Montero has yet to harness his home run power in 2011, and Vazquez is a guy that doesn’t need to play every day. They could DH him against lefties, which would free up Andruw Jones to give Granderson or Gardner days off against lefties as well. If he hits well enough, he could replace Posada as DH all together. Furthermore, because of his age, Vazquez might not get too many more chances to be somebody in this league. It would benefit him, and the Yankees, to showcase his abilities right now, when he’s at his hottest. Topping our list of must-promote players is a highly touted infielder for the Toronto Blue Jays named Brett Lawrie. Lawrie was one of the gems of the Milwaukee Brewers’ farm system until this past off season, when he was dealt to Toronto for pitcher Sean Marcum. The Brewers, who also had previously acquired Zack Grienke, smelled a chance to possibly win in 2011, and emptied out the minors to get the players they needed. The Jays had an extra arm in the rotation and jumped at the chance to acquire the Canadian born Lawrie. Lawrie was drafted 16th overall by the Brewers in 2008 and immediately began showing the power and speed combination that had scouts salivating over him when he was an amateur. He hit 13 home runs in 2009 and stole 30 bases in 2010, while still maturing and growing into his body. His averaged topped out in the mid .280s, and he was considered among Milwaukee’s top prospects before the trade. In 2011, he really has put it all together. Playing a new position (the Jays need a 3B more than they do a 2B), Lawrie has hit .354 while clubbing 15 homers (38 extra base hits overall), driving in 49 runs and swiping 11 bases in 12 tries for the Las Vegas 51s of the Pacific Coast League. On their own, his numbers would be enough cause to bring him up, but the Jays truly do need him. Their current 2B, Aaron Hill, is hitting .239 with 1 HR and Their current 3B, Jayson Nix, is hitting .193. They have arguably the best hitter in baseball right now, Jose Bautista, but 13 of his ridiculous 20 home runs are solo homers. He has managed only 40 RBI to go with those home runs, and he’s hitting .360! No one is getting on base for the guy, and it is a shame. Inserting Lawrie into this lineup ahead of Bautista could lead to a couple more runs per game. It would make Bautista better, it would make Lawrie Better and, most importantly, it could be just the jolt the Blue Jays need to solidify their stature in a very tough division. The Jays may only be 4 games behind the Yankees, but they have 2 other teams to leap frog if they want to make the playoffs (Sox, Rays). This one is truly a no-brainer. When Will We See These Guys? I believe that Vazquez is the least likely of the three to get called up. The Yankees will undoubtedly summon the great Jesus before anyone else, and I wouldn’t really blame them for it. I understand the argument of letting prospects develop at their own rate and not rush them. Being rushed to the Major Leagues has undone many a great prospect before. However, if a team has a glaring need, why go out and trade a prospect for help when you can just plug that prospect into the lineup and see what develops?